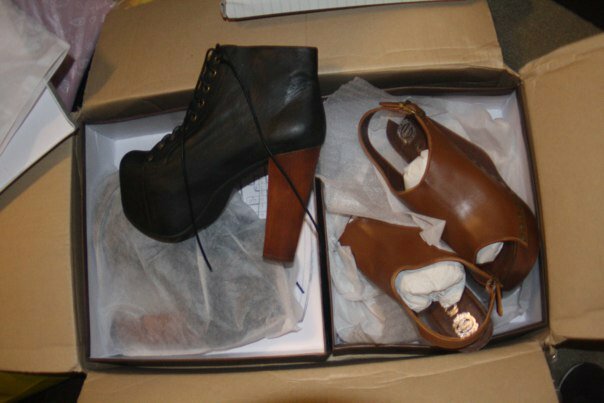 hippie gone mad: jeffrey campbell! i lost control when i saw these babies on solestruck.com... i post it awhile ago as my shoeporn then stalk every website who sell these babies...and finally when i saw the FREE SHIPPING promo from solesruck, i unconsciously asked my singaporean friend to bought it for me first. jeffrey campbell is a genius. these shoes are sooo comfortable! i can walk all day long with these babies, + got so many compliments from everyone who saw these shoes! i'm 175cm tall and these baby makes me looked 15cm taller... its nice to be 190cm for a day(evil laugh)... i saw many fake lita boots and snicked std wedges everywhere, i've tried em too, but its just not the same, it hurts so bad you could die! so please love your feet and spend more, it's your lifetime investment! jealous over those JC litass !! michelle: idk how to stop the twitter API pop up.. T_T will definitely ask my friend to help me... aaa it feels like heaven! i can walk 8+hours with those babies..